For Educational and Business organisations, please refer to our ‘Education' and ‘Business' sections. "We loved the ability to customise your screen display in the SEN edition to ensure you can read comfortably, and the typing and demo areas on the screen are clear and easy to use." "We are adding your great new product to our range"
"The Preference Screen is a fantastic idea - the kids are really lucky"
“I just bought your SEN/Dyslexia version typing course because I suffer badly from screen glare problems though not dyslexic. Love the product. Many thanks." "What I am looking for is a program that will teach the keyboard to the students. One where they can learn where the keys are and the proper way to hold their hands when they type. 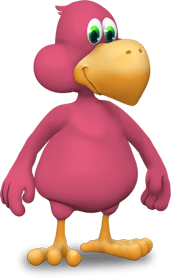 I like KAZ because it has monitoring and testing and review." "Having looked at the KAZ programme, I feel that its use should be extended beyond SEN and Dyslexia to including persons recovering from neurological problems and any kind of trauma that has affected their ability to communicate. 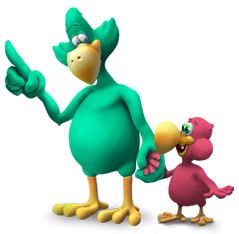 Using alternative communication includes teaching typing skills ." If individuals with special educational needs are equipped with the correct tools, they stand a greater chance of reaching their full potential. 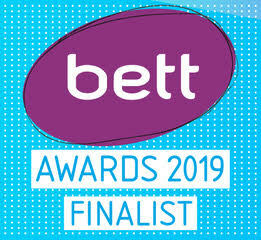 Through trials and feedback from special needs teachers across the world, it has been proven that touch typing and using a computer are formidable and even life changing tools that opens doors for individuals with special educational needs / dyslexia, as it presents a new and powerful medium for learning and communicating. Although the 'Standard' KAZ touch typing program has proved extremely effective, continued feedback from SEN teachers confirmed that approximately 10% of their students, the majority dyslexics, still suffered with disturbances relating to Visual Stress - that of white glare from background screens causing headaches, blurring, letters rotating, flipping, crowding and running into each other. So in order to address and help alleviate some of these disturbances, we took advice from several dyslexia experts – most notably, Dr. Sue Fowler and her team at the Dyslexia Research Trust, Reading Clinic and Oxford University. Over the last fifteen years the Trust have carried out extensive research, trials and visual assessments on over 10,000 children. Results found that the application of a specific shade of blue filter to help stabilize letter movement and of yellow, to minimize blurring, was extremely successful in the majority of children suffering with visual disturbances and had either improved or completely eliminated their problems – resulting in a rapid improvement in reading skills. These findings, together with the fact that every individual suffering from dyslexia is unique, in regards to the obstacles they encounter when reading and the help they require to alleviate these obstacles was the major points high-lighted. With this in mind, KAZ incorporated the above mention filters into their course and further developed their programme to produce are New SEN/Dyslexia edition, especially tailored for individual dyslexic users. 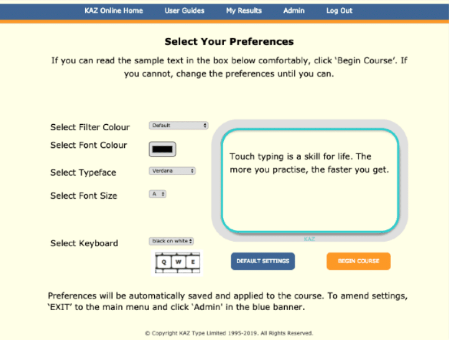 Incorporating a multi-sensory approach throughout, KAZ’s new SEN/Dyslexia Edition teaches typing skills whilst minimizing disturbances related to visual stress, by means of a unique 'preference screen', offering a choice of preferences. Once the user has selected their preferences and can read the sample text comfortably, these options are then 'Saved' and applied throughout the course, tailor making it and ensuring the learning experience is comfortable and enjoyable. The KAZ program uses a unique 'accelerated learning' teaching method. Incorporating both 'muscle memory' and 'brain balance', it engages the major senses of sight, sound and touch simultaneously, radically enhancing memory retention and recall - which is why it is so effective. Using specific combinations and progressions of just 11 words in 5 scientifically structured phrases, the method trains the fingers on both hands to work symmetrically and simultaneously – a direct result of both hemispheres of the brain working at the same time –‘brain balance’. No other typing tutor works in this way. With repetition, reading, spelling and vocabulary are engrained to memory and with ‘muscle memory’ spellings become a series of finger movements and patterns on a keyboard, reducing the likelihood of transposing and mis-spelling words. The Course is presented in a structured but light hearted manner to make learning fun and enjoyable. It solely focuses on teaching typing and does not include gaming or try to teach typing with other subjects, as research has proven that this splits concentration and in the case of SEN individuals, may overload the ‘working memory’. Once the first phrase is completed, a real sense of achievement is gained, motivating the student to continue onto the next phrase and so on. Each section offers instruction and encouragement in short modules in order to hold concentration and once again, avoid overloading the working memory. The student is allowed to progress at their own pace, acquiring the skill and gaining speed and accuracy without even realising it. As with many dyslexics, spelling is poor. With KAZ, the user does not have to rely on their spelling ability. All vocabulary is displayed on the right hand screen and they simply have to copy and type the text into the left hand screen – as learning to type and not spelling is the main objective. However, the tests and the SpeedBuilder module have been structured so that the user has to type the correct letter / key, before they can continue on to the next letter. With practice, ‘muscle memory’ engrains these actions and spellings become a series of finger movements on the keyboard, dramatically reducing the likelihood of transposing and misspelling words.This is why so many Special Needs Coordinators (Senco’s) and teachers recommend KAZ’s dyslexia typing course. 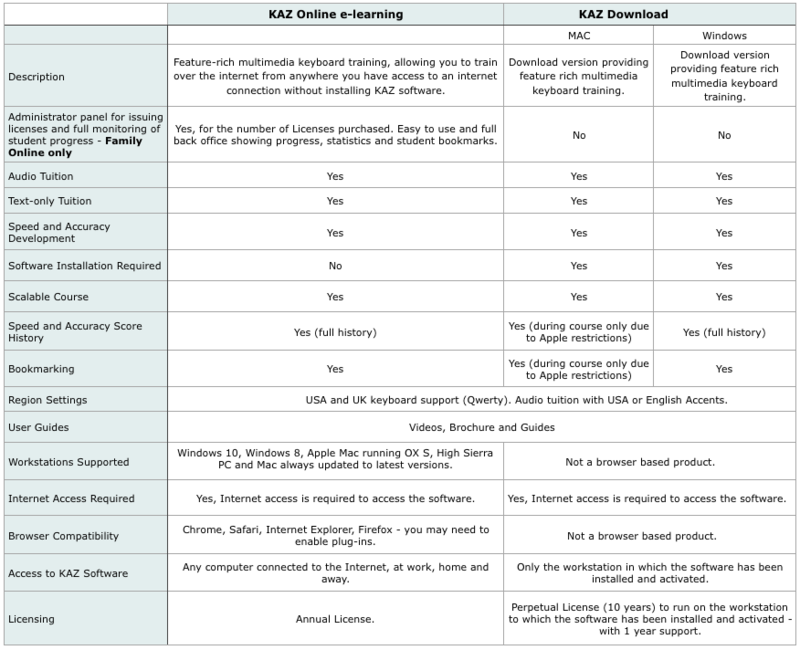 KAZ’s multi-sensory unique teaching method, combined with its new ‘Preference Screen’, delivers a student tailored, simple yet dynamic course. 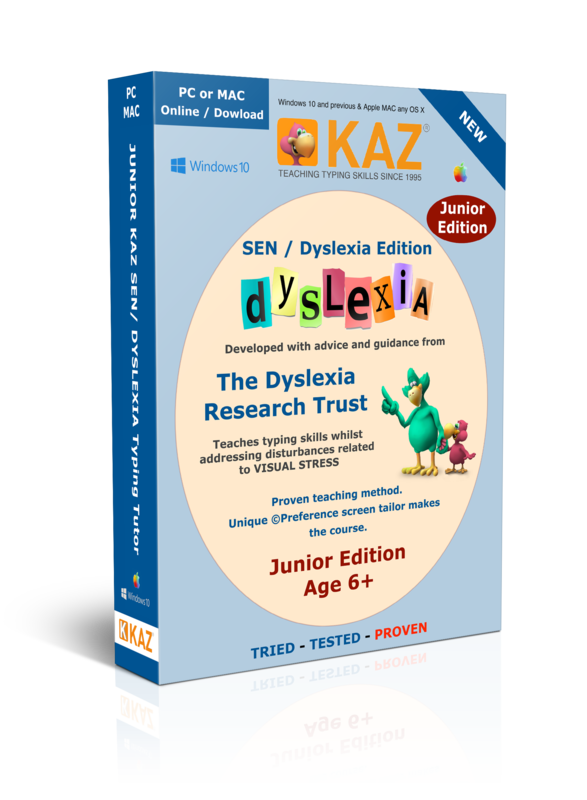 Our NEW Junior SEN/Dyslexia Edition (age 6 - 11) includes the same unique ‘Preference Screen’, uses the same proven teaching method and includes all the benefits of the KAZ Adult Typing Tutor but with age-related vocabulary, fun imagery and amusing animations - designed to hold the interest and concentration of the younger mind. However, we recommend adult supervision when first using the ‘Preference Screen’. 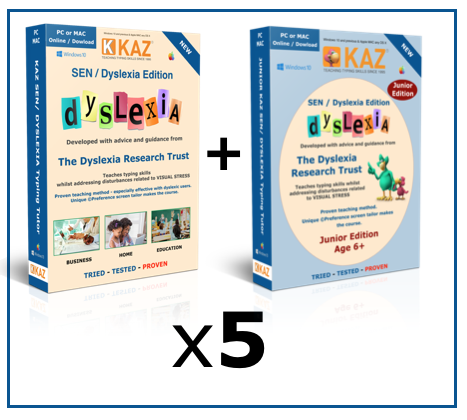 Our New Family SEN/Dyslexia Edition offers a choice of both Adult and Junior versions, available as a cost effective 5-user multi license for the price of three. Dyslexic family members should use the ‘Preference Screen’ to obtain their preferred settings. Non dyslexic members should simply begin the course on the pre-set default settings. The Online edition includes an ‘Administrator Panel’ where the administrator can choose and allocate the appropriate license to each family member and can monitor family progress (bookmarks, speed and accuracy). Now everyone in the family can learn to type. All our products comprise both UK and North American options. With in-excess of one million users worldwide, KAZ has been tried, tested and PROVEN in thousands of schools, businesses and government departments globally and is now available to you direct to learn and use in the comfort of your own environment. Learn to type easily, efficiently and effortlessly and gift yourself and your family with an invaluable 'life skill'.